Grow early or tender plants, or pest prone plants. You can grow bright, beautiful or statuesque plants wherever there's light with help from container gardening. You can protect edible plants from pests, free up some land and, why not try fragrant herbs in a window box. Indeed all those hard dry spots over concrete, paved or gravel yards can be greened up and made alive. Containers or raised beds will help you garden over waterlogged areas too. Attractively decorated containers will not be distracting when they are balanced by large, bright decorative blooms. With many kinds of container for growing and stylish accessories such as obelisks and mirror orbs, container gardening is one of the most creative of all gardening styles. So don't think of it merely as an easy way to grow a few plants. Unfortunately and all too often, containers become an easy way to produce a neglected and cheap looking garden. But you can do better with this help. Read on to find more about the advantages of containers, and how they can be used to good affect, along with advice on what to avoid. Container gardening should really be confined to the special situations where nothing else grows - and it is especially useful for patio gardening where both container and plant help set the style. Your choice of container is very important - but first what kind of container garden do you have in mind? Note to Organic Gardeners: containers are only viable where nothing else will do. They do nothing to improve soil or make garden compost. Never abandon good ground to containers. They disconnect with nature. Use containers to grow specially suited plants and to enable growth on sites that are otherwise limiting. gardens with artefacts, such as models of fairies, gnomes and animals. The formality of container gardening provides many opportunities for you to be extra creative. So you can actually reinforce this style by adding suitable artefacts. There are many to choose from: trellis work, bean poles, obelisks, mirror globes, water falls, and ornaments ranging from statues to model animals. 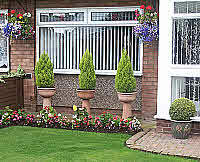 These can be combined to reinforce what is essentially an artificial style of garden. Click Here to view a range of ornaments and supports for container gardening. Does their shape & size match the window behind? Would they be better lined out along a drive? Container gardens are often sited next to built on areas - in these situations at least, they can blend with surrounding constructions. Therefore, when choosing containers, consider the style, shape, scale and texture of the surrounding area. How will your containers blend with their setting? Against walls of brick or stone - what is the color, scale and texture of the brick or stone? On ground surfaces of patterned colored concrete, paving, blocks, or aggregate. What is the color, scale and texture of these surfaces? Consider the shape and size of the garden space. For example, straight edges fit rectangular containers best, and tall or wide containers may need to be balanced for visual effect. Choose both container and plant to match. Consider a style of container that suites your garden. Formal gardens with topiary can blend with artificial ornate styles. But a clean clear patio blends well with simple designs. 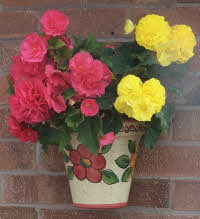 Masses of brightly coloured flowers will balance brightly coloured or decorated containers. However, decorated containers won't suite architectural specimens that have statuesque and shapely qualities. Types of container range from porous clay pots to glazed earthenware and stone, and light plastic to metallic and wood. Wood containers usually have an inner liner. One stylish fashion a few years back was to re-use ornamental chimney pots. 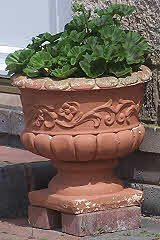 Nowadays colored and glazed urns are popular for patios. Rectangular containers fit corners best. The blue slice breaks up the outline nicely. Traditional clay pots, bowls and urns are round because they are made on a potter's wheel. A rectangular shape would need a strengthening rim or rib. However, to combine with patios, paved areas, and walls, there is now a wide range of strong rectangular containers kilned at high temperatures in beautiful shades of glazed earthenware. Glazed earthenware has good qualities in durability, style, reduced water loss, and resistance to algal growth. As manufacturers respond to demand these have become less expensive. You'll also find modern containers made of resin which is a lighter substitute for ceramic see below. Porous clay pots loose moisture easily so the compost dries quickly. They are more vulnerable to flaking after icy weather and harder to clean. Plastic containers are cheap but cold for plant roots to grow in. Sunlight makes plastic brittle and the colors fade. You can find tubs, barrels, bowls, and boxes in both plastic and natural materials. Your containers should have ½" holes in the bottom for drainage. Do check that the holes in plastic tubs have been punched through. Some plastic containers have a nozzle that raises the hole inside by about an inch. This conserves a pool of water and the bottom should be lined with course grit and stones. Wood containers make a good match for organic style container gardening. Machine finished timber can be made to match chairs and tables. They look good indoors too. Timber window boxes are especially attractive. Alternatively, you can take a rough and ready approach by wrapping log roll around plastic tubs or fabric liners filled with compost. Old sinks may be used after coating with hypertufa. Click Here to view a range of containers to select for your style of garden. 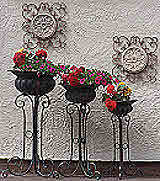 Many home owners place hanging baskets around doorways. Do remember not to obstruct spaces that your visitors stand in or walk into, as they will unwittingly bang their head. Remember the above when choosing hanging baskets, window boxes and containers for walls and, when selecting your plants. In general small containers dry out more rapidly. But there are self watering hanging baskets and wall boxes available to help reduce this risk to plants. Small containers are best used for drought tolerant plants such as cacti, succulents, some Mediterranean plants, ornamental grasses and small alpines. Avoid placing thirsty shrubs and trees into containers. You can however limit the size of vigorous shrubs and trees by growing them in a container. You'll also find links to self-watering containers. A steady water supply helps your plants and reduces the guesswork. You only have to fill the reservoir at your convenience. And there are now add-on watering kits to go inside existing containers. Create a Stylish Container Garden with the help of the links below. Why are container gardening soils special? Container soil or compost is out of contact with the deep reservoir of water found in ordinary earth. The boundary with the container can dry out hard. Then your compost becomes closed to absorbing water and air. Top watering simply flows down the side. While inside plant roots are sucking the container soil dry. For these reasons garden soil is rarely suitable for growing plants in containers. You really need to use a special soil mix. Tried and tested container compost can be bought using these links, or you can mix your own. Another problem with including unsterillised garden soil in your mix is that it contains weed seeds. Soil based mixes are heavier, which is useful for wind exposed roof gardens, but not ideal when containers need moving. So first off, always use a compost mix that is open, well aerated and moisture retentive - like those recommended on these links. Secondly, I suggest that you avoid growing plants that can't tolerate dry spells. Rhododendrons, Azaleas, Blueberries, and heathers for example, all need a moist well-aerated root zone. So can you keep your planters watered and do you have lime-free soft water? 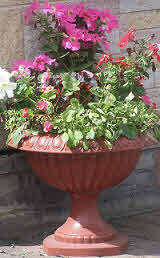 Yet there are many plants that are more tolerant of container gardening. Remember: well-aerated, water retentive and nutrient holding. You can make an organic mix from finished, sieved garden compost. 5 parts compost, 1 part course sand and 1 part vermiculite or perlite plus, one handful of organic fertilizer per 7 gallons of mix. Organic gardeners usually avoid the unsustainable use of moss peat. Coir is an alternative organic component and is available in solid bricks to reconstitute. It is a waste product of the coconut industry. You might add shell to mixes for moisture loving plants or water holding crystals for hanging baskets. You can the save time by using suitable compost mixes for easy container gardening that are available from here. First ensure that your planter has drainage holes. An ordinary pot or growing bag can be placed inside decorative containers that have no holes. This double wall can reduce water loss. You will avoid nutrient wash-out with easy bottom watering of the free-draining pot that is on the inside. I suggest placing a layer of pea sized gravel and perhaps shells on the bottom. This provides a reservoir of water an inch or so deep. To prevent the compost sinking into this grit, I suggest placing a layer of capillary matting on top. Layers of waste wool, cardboard or paper will also help. Fill your container a layer at a time. Gently firm each layer to ensure there is good contact for water conduction and no wide open spaces. Fill to about an inch from the top. I suggest covering the top of your container with one or two layers of newspaper, (or try punctured white polythene sheet). Cut slits in this for planting through. Top it off with a layer of light colored ornamental grit. These toppings help to reduce evaporation - but see below for alternative method with vegetables. Plants may need re-potting when they become pot bound or because the organic part of their compost has broken down to a formless mass. Pot bound plants have old hard roots circling their container. Water and nutrients have to travel further but it is young active roots that are most important for absorption. So before replanting, cut way some of the old fibrous roots to encourage new fibrous roots. Make sure that your container gardening compost is moist and that your plant's root-ball has been thoroughly soaked. Fill and firm the compost around your plant as it goes in the hole. Then leave your plant in a sheltered spot to recover. Wide shallow tubs are often used for growing salad crops. You could add a maypole for growing climbing beans. You will probably start these from seeds. So you will wait for your seedlings to grow before adding a water conserving mulch such as straw, vermiculite, flat stones or shell. Containers are especially useful and convenient for patio gardening and balcony gardening. Planters that have pockets in the side can be used for strawberries, and they keep your fruit clear of soil. Why not grow a bigger crop - take a look at my page on growing potatoes in bins. You can grow a wide range of herbs on your patio using containers - Sage, Lavender, Rosemary, Thyme, Onions, Garlic, Mint... and by using tubs you can grow them together with vegetables such as carrots, onions, lettuce and beans. However, herbs do differ in their soil preferences, so it's best to have several small containers for them. Origanum likes sunny well-drained sites, Basil enjoys a rich moist soil, Parsley too; while Rosemary could probably survive on spent compost (an organic treat gives you more growth). Keep all this in mind when filling and planting up multi-box herb containers such as, a herb wheel for your patio. So containers make it possible to choose the soil and site for your herbs. Mint enjoys rich moist and shady sites and, Mint is especially suited to containerisation to prevent it rampantly spreading. Rosemary can be brought indoors for protection during hard winters. 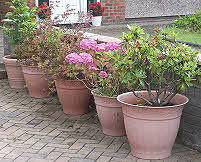 Containers are ideal for growing bulbous plants. Many such plants are dormant for a considerable time and they can often withstand dryer conditions. Baskets are available for submerging bulbs and corms in garden soil. This helps you to find plants such as Gladiolas to remove them for storage and protection out of season. On the patio however, you can make use of free standing tubs for your flowering bulb display. With Daffodils and Narcissi you'll make a big impression by planting your bulbs in multiple layers at different depths. By mixing early and later flowering bulbs you'll get a longer display. Containers that have planting pockets provide even more space to fill with the color and scent from hyacinth bulbs and crocus corms. Don't forget that bulbs can be planted in the same containers as shrubs and perennials, perhaps as an early flowering under layer. For a stunningly attractive focal point with fragrance, why not try growing Lilium (Lilies) in containers. Amaryllis (or Hippeastrum) also makes a striking feature for the late season and for winter indoors. What kinds of shrubs are suited to container gardening? Consider small leaved, well branched, neat and compact, perhaps evergreen shrubs that flower profusely. Examples might be found with Hebe, Buxus, columnar Berberis and Holly... Decorative leaves and fragrance are found in shrubs such as Choisya (Mexican Orange). Then, influenced by Japanese gardens, you might include the ornate leaves and statuesque shapes of Acer varieties, but they suffer on wind exposed sites. They combine well with cloud pruned conifers. Add more drought resistant plants such as clipped Lavandula (Lavender), or Santolina (Lavender Cotton) and Rosmarinus (Rosemary) - these are just a few. Containers are useful for growing fruit bushes in small spaces. Try growing apples as upright cordons or as bushes with multiple varieties grafted onto one rootstock. Do you have a sunny site near a warm wall? You could use a deep container or planting pocket to grow a luscious sweet Fig. Or try growing citrus fruit on your patio in free standing containers. Kumquats, Limes, and Orange bushes are especially tempting. Some shrubs are grown as pyramids. These include specially prepared multi-flora Roses. A climbing frame is usually needed for support. Flowers have been bred to trail and tumble from planting pockets in containers. These include varieties of Nasturtium, Petunia, Lobelia, Pansy and many more. You can plant up the pockets in a hanging tube or use a post with planting pockets. You'll get masses of flowers that look truly stunning. These have become popular for growing tomatoes, peppers, strawberries, as well as tubes of hanging flowers. You need to pay attention to the design of the planter and you might expect to be watering them every day. 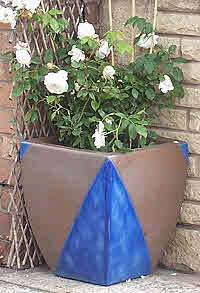 The better designed planters have a water reservoir in the top which provides an even watering from capillary tapes. Cheaper Upside Down planters have several problems. Additional planting pockets in the sides will leek out the water you add. Although these cheaper planters have a central tube for watering it is not very effective. If the top of the planter is not covered and you don't use a sterilised soil mix you may get weeds growing out of the top. Planters with a water reservoir on top and a capillary feed may work better. The bottom of the Upside Down planters has a sponge with a slit that neatly fits around a young plant. You need a strong structure to support the weight of a cropping plant, compost and water. The sloping spars of a typical aluminium greenhouse roof are not suitable, but you might attach supporting cross bars to the uprights. Tender perennials that need bringing inside for storage over winter are often more conveniently grown in containers. These include Chrysanthemums and Dahlias as well as Begonias and more exotic perennials. Smaller sized decorative flowers look great when massed in hanging tubes and pyramids - see above. Bamboos and ornamental grasses should not be forgotten. Try mass planting flowers in wide tubs or boxes. You can select flowers so as to vary the height. Also, perennials that are prone to slug damage, such as Hostas, may be better protected when grown in containers. Copper strips are available to give slugs and snails a shock. Your e-mail address is totally secure with SiteBuildIt. I use it only to send you News from The Organic Gardener.